The grandness of this single sink vanity is enriched by the elegantly shaped frame within the cabinet doors and the decorative carving along the sides of this generous sized piece. 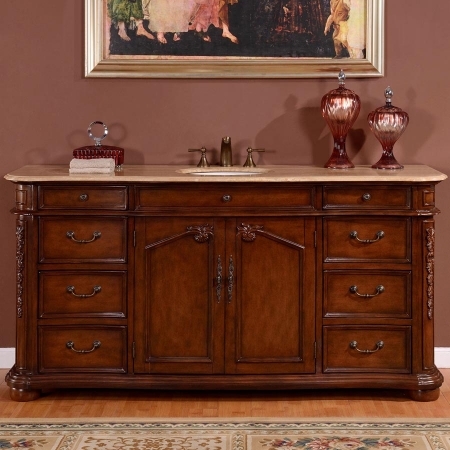 These elements add a very special touch to the great functionality of the piece as well. 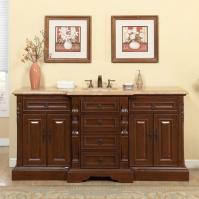 The double door cabinet has an interior shelf and eight drawers provide ample storage space. 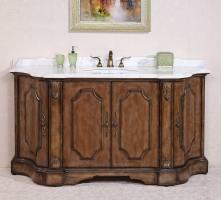 The warm and rich tone of the wood finish is enhanced by the natural beauty of the travertine counter top. A welcome addition to the space, this vanity will be appreciated for many years to come with the high quality materials and craftsmanship.